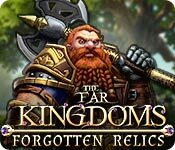 The Far Kingdoms: Forgotten Relics is rated 3.5 out of 5 by 13. 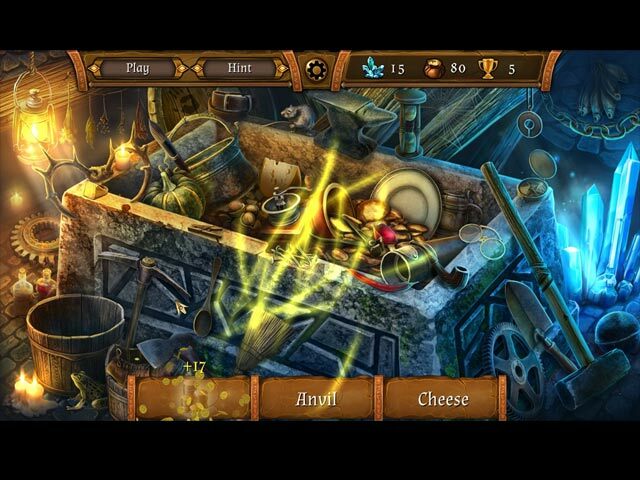 Rated 5 out of 5 by verimeri from Best Far Kingdoms game! The Far Kingdom developers really listened to feedback. This game is much longer than the previous ones. You work your way around gaining stars and money to buy power ups. You also fix broken castles. Here is a tip for those complaining you don't get enough chests for coins to buy boosters. Only buy the jokers- they are only ten gold coins and they are all you need. Why buy a 20 coin booster to remove one card when a 10 coin joker will work just as well. There is only one negative thing I have to say. Sometimes you have to put the hammer to the rock several times before it finally breaks. This does not seem to be a problem with the sword to cut vines. Overall this is the best Far Kingdoms game ever. 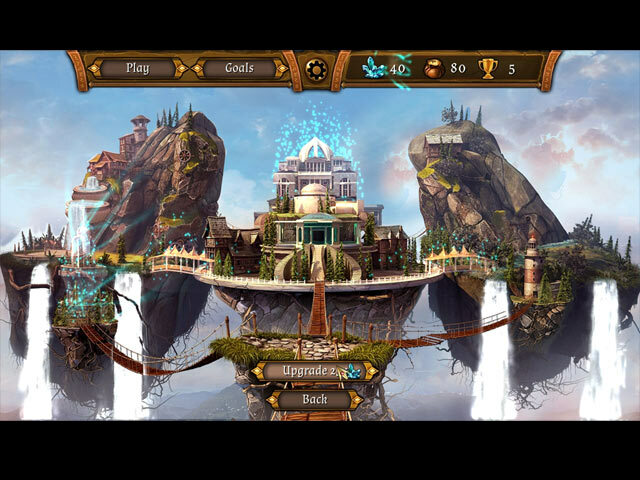 Rated 5 out of 5 by pennmom36 from The Far Kingdoms Solitaire Has Made Some Improvements I'm on the fence with Forgotten Relics, the latest edition to The Far Kingdoms series. They have made vast improvements in the graphics department, and added a few new features, but the solitaire levels themselves, are super easy. In fact, I received perfect scores on the first attempt, for the first 14 levels! I have purchased every game in this series, and they are all entertaining, so I'm going to go with my gut instinct and assume that this game will become more challenging as I progress. You can play this Higher/Lower Solitaire game in a Timed or Untimed mode, which is a new feature for this series, and a feature I've never seen done before on a solitaire game. I haven't quite figured out all the logistics with this feature, but from what I can tell, the timer keeps ticking, and stops when you end the level, but, it seems that it picks up where you left off. So I'm not sure if it resets after 10 levels, a new chapter or what, because to be honest, I kept forgetting to look at the timer. If you replay a level, the clock does NOT reset! Bonus levels are unlocked with each main level you complete, and are shown at the bottom. You can play the Bonus levels at anytime, to receive Badges or Trophies, another new and unique feature. Before the start of each level, you can choose up to 3 Bonus Features. You must first purchase the bonus of your choice, and how many of each feature you want by clicking the plus sign, then you can select which three to access on that level. The Bonuses are Jokers (a wild card) Dragon Flame (removes a card of your choice) Dragon's Claw (removes 2 cards) Fire Arrow (opens 3 random cards) Dragon's Eye (let's you see the next deck card) 5 (gives you five extra cards in the deck) Undo ( give's you an extra undo) and Eternal Twirl (reshuffles the cards). Most levels have a Crystal Card which can be clicked on once uncovered, and used to Upgrade the Kingdom's during the adventure. The only negative about this feature is that you don't get to choose which upgrade you want, it simply tells you how many crystals are required for the next upgrade, and something shiny is added to the castle or the grounds surrounding them. 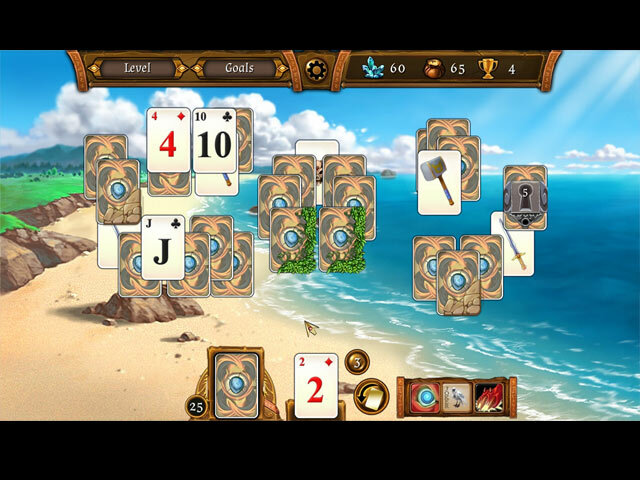 Some levels also have Jokers mixed within the board cards that can be used as a wildcard, and is helpful because some Locked cards require a number specific Combo (such as a combo of 8 consecutive cards) There are also blocked cards that require you to uncover a tool such as a sword card to cut the vines blocking card groups or a hammer card to break the stone blocked cards. This is an entertaining Solitaire game, with some really interesting features, hopefully, after the demo, the levels will become more challenging, enjoy! Rated 4 out of 5 by tp299 from Stuck on 47 Overall a good Solitaire game. Good graphics, music. Played all levels including Bonus levels. Rated 4 out of 5 by ninja226 from A fun game, but minimal boosters This is an adventure solitaire game. You earn blue crystals that allow you to upgrade various structures in the kingdom, similar to the castle building in Jewel Match game. Levels also result in relic parts. Coins earned from HOPs allow you to buy boosters. Technically, there are 120 main levels and 30 levels for earning badges. There are 2 modes of play--Timed and Untimed. The untimed mode locks up all boosters, and this becomes challenging in that each card deck ranges from 22-25 cards, and if you get a bad hand, you cannot complete the level to earn 3 stars. You have to replay a level multiple times to get 3 stars. Other than that, it's a great game. A bit repetitive, but you can play mindlessly while watching TV. The artwork is good. The HOPs repeat themselves, but some objects are camouflaged well. There is a bit of a storyline, but no voiceovers. Game would have been excellent if: 1- more levels added (150-200) 2- add screensaver capability 3- add jigsaw puzzles or mahjong for variety in between solitaire 4- no timed or untimed mode. It doesn't make sense for solitaire. Rated 4 out of 5 by kore21 from not so easy without boosters i've played all their solitaire offerings, so...thought i'd add the game is not quite as easy as some make it out after awhile... IF you don't buy a lot of boosters. opening a combo lock of 9-13 cards without boosters is sometimes a bit of a challenge. which is just fine by me. & there are a lot levels, plus bonus levels, so i don't think i'll breeze thru this one quite as fast as some of their earlier games. glad they still have the card combo locks, which you don't see as often in solitaire, & is one reason i like their games. the option of a timed game is new, but is something i don't need in solitaire. absolutely not. their booster system is a little different from their previous games. it took me awhile to figure out how to get into the store, since there was no help for this. however, i'm glad to see they are not afraid to experiment with their game mechanics, which keeps the games from being mere clones of each other. the swords & hammers can be a little troublesome to remove the obstacles. basically it seems like you have touch the handle and not the blade to the obstacle to get it to work. once i figured this out, it's not a big deal. as usual the music is halfway decent, tho again one song out-blares the others & i have to constantly adjust volume :P i've replayed their other solitaires just for the music. this set, not quite as inspiring, but okay. the most disappointing part for me (& i almost didn't buy it for this reason): they dropped the characters from the card face options. we are now stuck with only boring numbers on the card faces. bad, bad. the characters usually support the storyline--granted there is not much story here, but i've kind of gotten used to their characters after playing several different games. i hope the devs put the character faces back with their next offering. please? Rated 4 out of 5 by feanas from Cute Game Cute game, no story line but you can improve some buildings. Money chests do not drop very often. Power ups are okay but to equip them may be a tad confusing. Purchase first, then select. Rated 3 out of 5 by grandmamaj from A disappointment Was really disappointed in this game. I expected more depth. It doesn't measure up to the earlier Far Kingdoms games. Rated 3 out of 5 by Penguin66 from Blah I was enjoying this game even it wasn't much of a challenge..I have a big issue with this game where on Level 17 I go to use the hammer to crush the rock and it won't crush..Therefore can't progress in the game..Other then this the game wasn't too bad.. Rated 3 out of 5 by amminnc from Not sure about this one... This is a high/low solitaire game. You can play in timed or relaxed format. Very nice graphics and soothing music. The basic game levels so far seem fairly easy; have had to repeat only one to get 3 stars (highest rating). There are more difficult bonus games that allow you to "buy" (with the coins you win each level) power-ups to use on future levels, but I can't get them to work. Not sure if this is a design flaw or I'm doing something wrong. You can also "buy" upgrades to advance the storyline, but you can't choose which upgrades. Until I hear that the bonus upgrades are working properly, I'll wait and see on this.